Hitachi's CJ110MV variable speed jig saw features four stages of orbital action, a simple tool-less blade changing system, front-mounted LED light, and a powerful dust blower -- all packaged in a lightweight tool designed with Hitachi's signature aggressive, ergonomic style. Backed by Hitachi's industry leading 5-year warranty, the CJ110MV is ideal for users who demand a reliable tool that handles easily without scrimping on the high-end extras. Equipped with a powerful 5.8 amp motor, this jig saw has more than enough strength to power through the toughest materials with ease. The electronic speed control maintains consistent strokes per minute (SPM) even as the workload varies, and the variable speed trigger even lets you lock the speed setting, so you'll never suffer from numb, weary fingers during those extra-long jobs. The CJ110MV's 4-stage orbital action provides consistent, accurate and efficient cuts -- and the tool-less blade changing system is quick and easy, so it never slows you down and keeps work flow interruptions to a minimum. An industrial strength clamp provides a secure lock on the blade and the cast aluminum, nickel-plated base plate offers solid support for cutting while leaving the work surface scratch-free. The base plate bevels 45 degrees in each direction to better accommodate a wide variety of cutting applications. Hitachi's distinctive design incorporates ergonomic considerations to make the tool easier and more comfortable to use than ever before. Weighing in at only 4.9 pounds, it's the lightest in its class. The lightweight design maximizes maneuverability and decreases user fatigue so you can keep on cutting until the job is done, no matter how long it takes. The D-shaped handle with a patented elastomer coating has a secure non-slip grip that absorbs vibration for user comfort and exceptional control. This is an ideal variable speed jig saw for carpenters, general contractors, metal fabricators and siding installers. Applications include cutting shapes in wood, metal (mild steel, aluminum, copper, or stainless steel sheets), synthetic resin materials (Bakelite, vinyl chloride) decorative sheets, and other thin construction materials. The CJ110MV jig saw comes with a no. 41 blade and an Allen wrench. I bought this saw as a replacement for my old DeWalt jig saw, and it was a big mistake! the first problem which I did not realize until after I bought the saw is that there is no variable speed control in the trigger, making this saw very hard to control especially when you need to make accurat cuts. The L.E.D. light is a great feature, but I would trade it for a variable speed trigger. As far as the keyless blade change system is concerned, it works well, but does not look like it will hold up over the long run. My next problem is the worst, I owned this saw for about a month until the roller wheel that suports the back of the blade snapped off in the middle of a sink cut out, what a disaster, I am going to return this saw and buy the Dewalt or the bosch, this is what I get for trying to save 60 bucks, a piece of camel dung, thats all this saw is!!!! I bought the jig saw for a bathroom renovation and for use around the house. It has worked flawlessly. The ergonomic grip fits the hand very well and allows superior control of the saw. I had looked at several saws before deciding on the Hitachi and narrowed it down to these attributes: ease of use, value, and warranty (the Hitachi comes with a five year warranty). Other tools were either too expensive or had commercial/tradesman features that I just did not need. 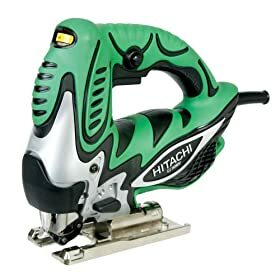 I have been a fan of Hitachi Power Tools from my early days as a plumber- using their rotary drills on a daily basis- they performed without a problem. The same can be stated for this jig saw. Unfortunately, many name brand tools are being manufactured in China (Hitachi included for some tools) by contracted companies with low quality standards. This saw is made in Japan with Lean Six Sigma standards; quality throughout. If something does go wrong Hitachi will replace or repair it up to five years after purchase so hold on to that receipt or register it. I give this Four Stars only because the variable seed is only slightly affected by the trigger. There is an adjustable wheel is front of the handle so be sure you select the correct speed for the material you are cutting first. After that, there is only a slight amount of speed variation that can be applied. Overall, this is a very good saw and a great value with its price and features. Haven't used yet, but I just got mine for seventy seven at the big blue place this afternoon. I bought this jig saw to upgrade from the one I currently have which is a skil. No comparison. The Hitachi has a light that helps you see your line and the motor blows away the dust as you cut, great feature. It also cuts very smooth, no vibration transferred to your work piece which makes cutting smaller pieces much easier. The handle is ergonomically designed making a very comfortable feel in your hand. It also has plenty of power or if you prefer you can dial your variable speed setting down to lowest and cut slower. It also has 4 different settings for orbiting the blade which you can set at 0 and have no orbiting for smoother more acurate cuts. One more great feature is the quick change blade feature, no wrench needed. You can't beat the price either. I bought mine for 100. Also comes with a factory 5 year warranty. I needed a new jig saw. I knew my 25 year old jig saw would not be capable of cutting the Brazilian hardwood we were using for our new deck. The jigsaw was necessary because of the semi-circular stairs my wife and I had decided would look neat coming off our deck. It was only a total of four steps, but it was much more complicated than we expected. The jig saw cut through the hardwood easily and smoothly, without the severe shaking I expected from my old jigsaw. Changing the blades was easier too. While the whole unit was heavier and larger than the old one, the handle fit my grip perfectly so that I could work for hours without tiring the muscles of my hands or wrist. Saw felt balanced and worked well for about, oh, ten hours. Then the assembly that holds the blade fell out. Of course, it was attached by screws which had long since shaken loose. Even if I could have found them, they would be incredibly difficult to reattach. In addition, their "keyless" blade system is tricky to use and does, in fact, not last for more than say, ten hours of work. I usually expect more of Hitachi tools. They must have been asleep when they designed this one. best one I have ever had it works great. This jigsaw is well built and fairly well balanced. The motor on mine gave out at about 11 1/2 months but no problem - it comes with a 5 year warranty and there are service centers all over (even in RI, which can't be said for alot of other major brands). Someone mentioned there's no variable speed at the trigger. This is true but who cares? Maybe with a drill you want to start off slowly, but with a saw, if you start off slowly, you're gonna splinter whatever your cutting. And anyhow, the speed adjust wheel in front is unbelievably simple to use. Overall, this saw is a great value for the money. Especially with the outstanding warranty. I am recently retired and I have a few home repair projects going on. I needed a new Jig Saw and didn't want to spend a bunch of money. This doesn't have all the bell and whistles, but who the heck needs all that. 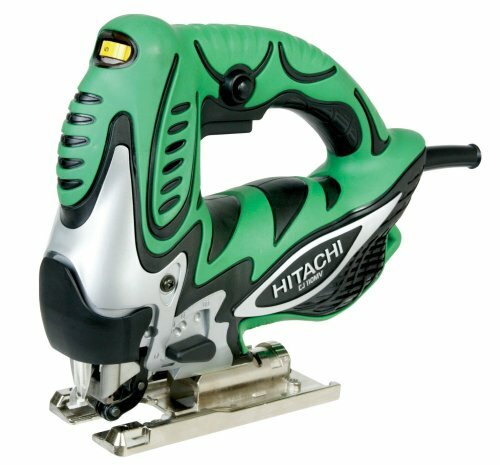 For an around the house, do a great job, great handling jig saw, this Hitachi fits the bill. I am very happy with this purchase. The jig saw seems to be made relatively well. I only use it once or twice a month, but so far so good. The quality of this Jigsaw can't be beat at this price. Excellent power with a cast metal base that is flat and true. Just dont expect variable speed at the trigger. This saw has a seperate knob to vary speed. I have used Dewalt units and you just don't get that much more for your money. I bought the Hitachi because of the Fine Homebuilding review and a great price. When it arrived, I tried it out, it cut beautifully, but then the blade fell out of the saw. After this happened a dozen times, I called Amazon, who said to return it and they'd swap it out, but I might want to talk to Hitachi 1st to see if there was an easy fix. So I did, and Hitachi said this happened about 10% of the time, and I could fix it locally or return it to place of purchase. So, another call to Amazon, they sent a new one in like 2 days, and emailed a label to return the old one. The second one works well in all the ways other reviewers speak of. In sum, if you're going to buy one, Amazon is a great vendor in terms of support. The process of diagnosing replacing it could not have been easier--unless of course they'd manufactured the saw in the EU or someplace where better QA would have prevented the problem in the first place, instead of, you guessed it, the host of the summer Olympics.